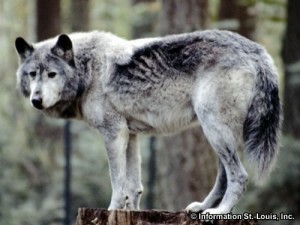 The Endangered Wolf Center is located within the Tyson Research Center in Eureka Missouri, in West St. Louis County. It was established by Dr. Marlin Perkins and his wife in 1971 for the purpose of preserving wild canid and wolf populations. It encompasses about 65 acres with 20 acres developed for the Center's facilities. The wild canid species that are at the Center are the Mexican Gray Wolf, the Red Wolf, the African Wild Dog, the Maned Wolf, the Iranian Gray Wolf, and the Swift Fox. Tours of the Center are available by reservation only and there are many events held each month. A fee is charged per visitor.